For us, “care“ is more than just part of our core business – it is a key value that demonstrates our responsibility to people and the environment. We want to enable future generations to live better lives by maximizing our own sustainability efforts. What’s more, we see this as an opportunity to inspire the people around us, develop stronger relationships with our employees, suppliers, customers and consumers and grow our business. Our sustainability strategy focuses on three areas: “Products, Planet, People”. It involves topics that comprise the entire value chain, from procurement of raw materials to the health and safety of our employees and changing consumer expectations. As a globally operating business, Beiersdorf is affected by the global decline in natural resources and the simultaneous acceleration of climate change. These factors motivate us even more strongly to use resources responsibly in our daily operations throughout the entire supply chain. We work closely with our internal and external supply-chain partners to improve our resource efficiency. The well-being of our employees is fundamental to our business success and is a top priority for us. We are committed to ensuring fair working conditions, transparent and respectful collaboration with everyone involved throughout our entire value chain. We recognize that it is vital to take responsibility for supporting our communities as well as disadvantaged families, in response to local needs. Thanks to our “We care.” strategy in 2018 we continued to deliver meaningful results on our way to achieving our 2020/2025 commitments. Learn more about our projects and achievements in 2018 and the current status of our commitments. We have set ourselves ambitious targets for our three focus areas Products, Planet and People. Do you have questions or require further information? Feel free to contact us. Find answers to our most frequently asked questions regarding our sustainability activities. Our sustainability performance indicators at a glance. Beiersdorf´s Climate Commitment for 2025 After we had already reached our “Planet” target of a 30% reduction in CO2 emissions ahead of schedule in 2015, we worked together with the World Wide Fund for Nature (WWF Germany) in 2016 on a new and ambitious target: A reduction of 70% of energy-related greenhouse gas emissions by 2025. This new target is aligned with the accords of the 2015 UN Climate Conference in Paris (COP21). Beiersdorf is one of a handful of DAX-listed companies to develop this target on the basis of the methods of the Science Based Target Initiative. 2017 is the first year of the implementation of this new climate target, and within this effort we will be focusing on switching over our electricity supply globally to renewable sources and implementing further energy-efficiency measures. We will also set concrete targets to reduce CO2 emissions related to the goods and services we procure. 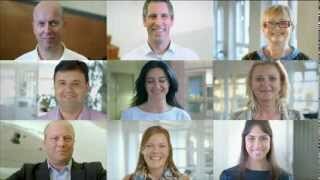 ´We care.´ 2016 - All about People Within our “We care.” Sustainability Strategy at Beiersdorf, we focus on three pillars: “Products”, “Planet” and “People”. In 2016, we asked our employees around the world to share some of their local initiatives and actions that contribute to our “People” pillar. These are health & safety initiatives for our own employees, product donation efforts and the support of social projects in our communities. NIVEA Indonesia #SentuhanIbu Under the motto ‘Sentuhan Ibu’, which translates as ‘a Mom’s Touch’, NIVEA Indonesia has launched an initiative to support mothers of handicapped children. 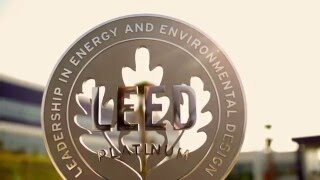 LEED Certification Production Center Mexico Our ´Blue Building´ program for constructing and using buildings aims at sustainably managing the entire life-cycle of its owner-occupied properties. This includes saving energy, conserving resources and, at the same time, providing a working environment for all employees which is both attractive and healthy. Our new production center in Silao, Mexico, is a good example. This 34,000 square meter building complex was developed following a committed sustainability concept. Since September 2014, the site is officially LEED-certified (Leadership in Energy and Environmental Design). Among other features, the new building boasts a modern CHP plant, photovoltaics and other highly efficient technological systems and installations. In accordance with Beiersdorf´s sustainability commitment, the new production site will emit around 55 percent less CO2 and consume 30 percent less water per ton of product than comparable factories. Beiersdorf - Sustainability Engagement 2014 Corporate Sustainability Vice President Inken Hollmann-Peters talks about continuing Beiersdorf´s successful approach to sustainability. 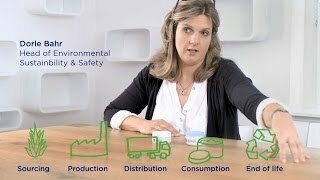 Life-cycle Analyses (LCA) Beiersdorf uses LCA to assess and reduce the environmental impact associated with all stages of a product’s life-cycle. The model we use considers inputs and impacts across raw materials, our own production processes, transportation, product use, recycling and Disposal. The results we get from our LCAs allow us to identify opportunities to bring more environmentally-friendly products to the markets and make progress towards our 2020 commitment. 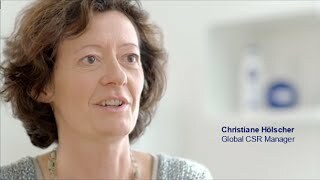 Social Responsibility at Beiersdorf Watch this interview with Global CSR Manager Christiane Hölscher to learn more about the strategy behind our social commitment. We believe families are crucial to a strong society and a key source of confidence and care. That is why we are providing long-term support for families all over the world. Our aim is to deliver tailored support on a local level to make sure we are meeting specific needs. We work with NGOs and organizations with local expertise to set up and lead projects and to ensure maximum impact for our social Engagement. 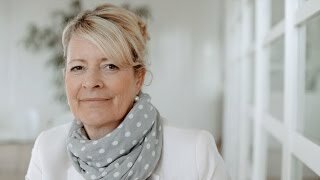 Beiersdorf - Continuing our Successful Approach to Sustainability Corporate Sustainability Vice President Inken Hollmann-Peters talks about continuing Beiersdorf´s successful approach to sustainability. In a business environment characterized by economic uncertainty, social pressures and environmental challenges, we strive to grow in a responsible manner. With our ´We care´ sustainability strategy we support our business goals whilst continuously reducing our environmental footprint. At the same time we are working to ensure that we give back to people both inside and outside the company. Beiersdorf - think planet After the successful launch in 2012, we rolled out our ´think planet´ campaign in 2013 to raise awareness about the small things that everyone can do to protect the environment. The message: be part of it, be creative and share your ideas with your coworkers. 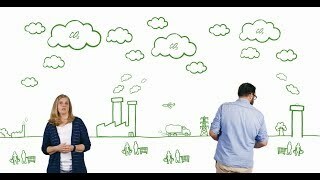 In this video, nine employees from different countries share the various ways that they are trying to be more environmentally-friendly at work. NIVEA Family Playgrounds in Serbia In Serbia NIVEA is carrying out a project to tackle a pressing social issue: lack of safe playing areas for children and their families. Due to long-term neglect and limited government funds many playgrounds in Serbia are unfit for use, or even dangerous to children. By posing the question ´Who cares where our children are growing up?´ NIVEA has prompted public debate on the issue and is now working with local authorities in various cities to construct and repair as many playgrounds as possible, so that they are safe places for children to enjoy and families to spend time together. These building activities are taking place all over the country. 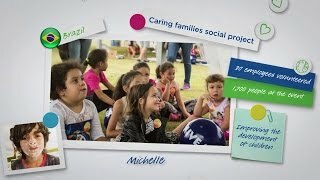 Beiersdorf - We care. I care + I care = We care. We have been acting in a responsible way for more than 130 years. However, we continuously challenge ourselves to improve our sustainability performance. We want to inspire the people around us and actively involve our employees in bringing our strategy to life. We know that our strategy will only reach its full potential when each and every employee within Beiersdorf implements and continues to develop it. After all, ´We care´ is the sum total of many individual ´I care´ commitments.